Back to the Future Day is finally here! It's October 21, 2015 the day Doc and Marty use the Delorean time machine to travel to the future...which is today. It is obvious science has failed us because we have no flying cars, hover boards, or power laces. However just because science has some work to do doesn't mean we can't celebrate. We just watched Back to the Future with the kids for the first time and they loved it. It really took me back to when I was a kid. Man I want a working hoverboard. other nods to the movie such as the Cubs winning the World Series and dehydrated mini pizza. I made the lunch in an Easy Lunch Boxes container. Make sure and follow me on social media so you don't miss any of the fun stuff (like my other Back to the Future post today). 1. Cut a slice of bread and tortilla into the shape of a skateboard. Spread nut free butter on bread and strawberry cream cheese on tortilla. Place tortilla on top of bread. 2. Set dried mango and strawberry slices on top of tortilla as shown. Place small tortilla circles and grape where shown. You can hold the grape on with a toothpick if necessary. 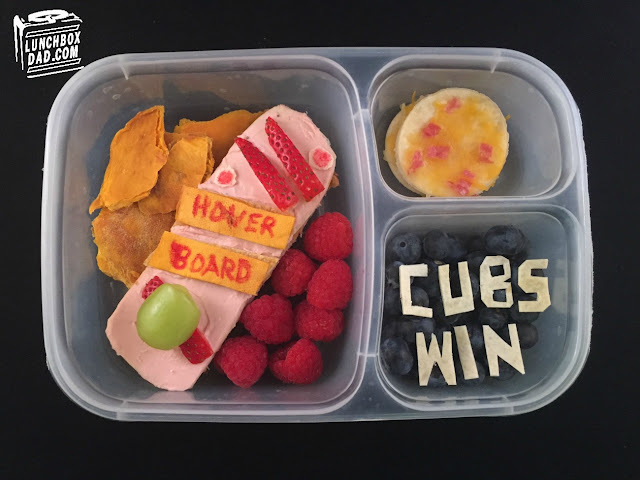 Write hoverboard and draw red dots with food coloring marker. 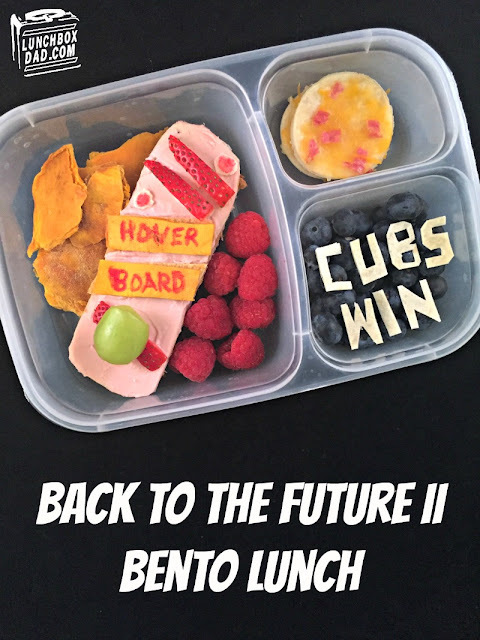 Place hoverboard sandwich in main container and surround with raspberries and dried mango. 3. Cut circle shapes out of tortilla. Sprinkle cheese and tiny pepperoni bits on top. Melt in the microwave. Let cool and place in side dish. 4. In second side dish place blueberries. Cut letters from tortilla scraps and place on top. I glues them on with honey.